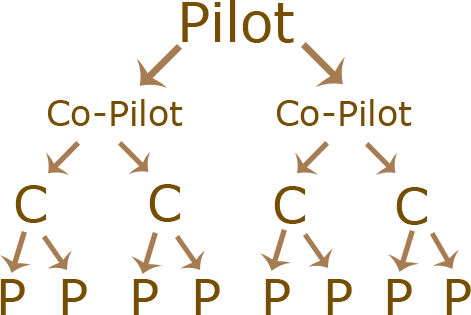 A pyramid scheme is a business model where the payment is paid with the participants' payments, instead of actually investing the money. This means that whenever someone enters the pyramide scheme, there should be at least 2 other people to pay for the first participant's profits. The participant often has to recruit other people to the scheme to get a payment. Since a pyramid scheme can't go on forever (there's no endless supply of people), it ends somewhere, leaving A LOT of people without a payment. The creator and some of the first participants are the only winners to this scam. Pyramid schemes are illegal in most countries. The creator of a pyramid scheme offers an amazing idea, the participant, let's call him Harry, has to make a one time payment of $1000. He has the rank of passenger. Now he has to recruit 2 people to join the scheme. After he did this, he will move up one rank, Harry is now a 'crew member'. These two people also have to recruit 2 people, everybody will go up a rank now, making Harry a 'co-pilot'. The newest two members must also recruit two others. After this is done, Harry will be a captain, and at the end of this chain, Harry will have 14 people beneath him. Harry will finally get paid, he will earn the entry fee's of the 8 newest passengers, $8000. Harry will now leave the scheme, making room for a new captain (but not until two new people are recruited). Since it requires a lot of people to actually 'finish' a pyramid, usually only the first few will finish it and get paid. When people start to notice the decline of participants, the creator will 'disappear' with the money, leaving a huge deal of participants with a big deficit. A matrix scheme has the same idea as the 8-ball method, except you won't get paid with money, but with a product. You will buy an, often useless, product for a rather high price. When you buy this product you will enter a list to get a nicer, more expensive item, for free. You will be at the bottom of this list, and when somebody else buys the product you will go up a place. Once you are at the top of the list, you will get the desired product (often a console or television). This is often done at webshops, and only works because the product you have to buy to enter the list is very expensive. The webshop will easily make a profit. The Ponzi scheme is the most interesting pyramid scheme. 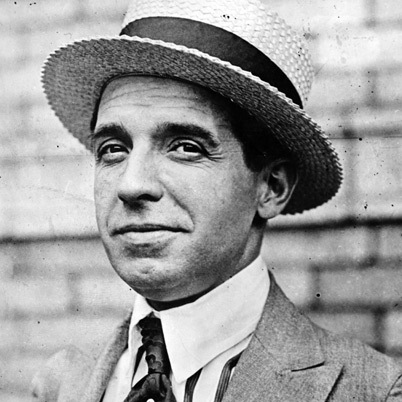 It is named after Charles Ponzi, who created the scheme and ran it for 6 months, after which he got arrested for fraud. The creator of a ponzi fraud often claims to have found an amazing investment plan, but needs money to invest. He will offer huge interest rates. This will get the attention of a lot of people, and there will often be a lot of participants. For this example we will take 10 participants who pay $1000 and get a 50% interest rate. The creator will pay interest to those 10 participants, leaving him at a deficit of $-5000. Everybody now knows this scheme is 'legit' and will tell their friends, invest all their savings or even go as far as to borrow money, or sell their property to invest in this scheme. The creator gets 20 new participants, he will now have $15,000 and 30 participants. He is going to pay interest another time, leaving him at a total of $0. Since the scheme is big news now, 100 new investers will join the scheme. The creator now has $100.000 and doesn't want to play anymore. He will leave with the money, leaving everybody without their payment. The first participants earned $1000 from interest, but won't get their initial amount back, so they split even. The second group of players have a deficit of $-500 and the last group of $-1000. The only winner is the creator. Most pyramid schemes are illegal in the majority of the countries. Even participating can be illegal. When a scheme is ended by the government, players can be forced to pay their profits to the government, even when they weren't associated with the scam. This money will go to whoever lost money on the scheme. Most of the money will dissapear with the creator though. Note: The examples in this article are very simplistic and most pyramid schemes are way more complex. If you ever run into something that might be a pyramid scheme, be sure to avoid participating!